I absolutely love these customized clocks! They really are a great gift idea and would truly be fun to design for specific friends and family members. I really appreciate the instructions for designing your own customized clock. Zazzle can seem a bit overwhelming at first, but your directions will definitely help the beginner feel right at home. Welcome to Review This! BarbRad! I have enjoyed your articles online for many years and we are delighted to have you as a member of our Contributors staff. One reason I love Zazzle is because there are so many possibilities for finding the perfect gift. Often that perfect gift is one you make yourself. Zazzle makes it easy to do that without ever getting your hands dirty or developing a new skill set. I feel right at home here working here with my old friends again. Thanks for taking me on as a contributor. Love the clocks and love how you put this page together. Glad to see you on our site! Heather, I know I'm going to enjoy being here. So good to be back in touch with those I've missed as we all spread out to other sites. I love Zazzle products and order them myself, so it's fun to help others discover them. Love your review of these fabulous clocks available on Zazzle. Customized clocks are perfect to find one that exactly fits your decor or interest. BTW, Barb, I have fallen in love with the 'Who Cares' clock! It's not the message; it's the scene. That has GOT to be Morro Rock in Morro Bay, CA. Am I right? I lived for 7 years where that was a view for me. :-) Brings back fond memories! You are right. It is Morro Rock. I love taking photos there. I have Morro Rock on many of my Zazzle products. I recently sold a canvas print of it, and I know I've also sold hats and cards. You aren't the only one who likes Morro Rock. It must have been nice to see it every day. These clocks are gorgeous! What a terrific idea to use our photos of family or friends or to personalize a clock and give it to them as a gift; now why haven't I done this yet! This would make a beautiful gift that would last a lifetime, not to mention how easy it is to do! What I like about Zazzle clocks are that almost anyone would love to have one, especially if it's obvious a lot of thought went into customizing it just for them. In today's world so often the personal touch is missing and even gifts can be quite impersonal. Something made just for you makes you feel valued and known. Anyone can buy a gift card, but not everyone will take the time to let a gift say something personal. Thanks, Margaret. One can be as creative as one chooses with these. Wow! This is a very creative idea. 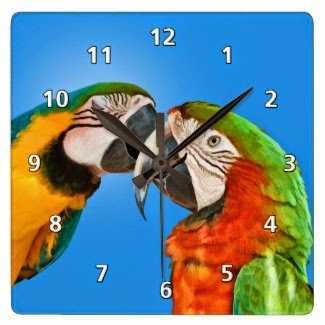 I have not made customized clocks yet at zazzle. Thanks for the tutorial. Thelma, I didn't get notified of your comment and just discovered it. Did you ever make your clock?